May 2015 – Here there Be Dragons! 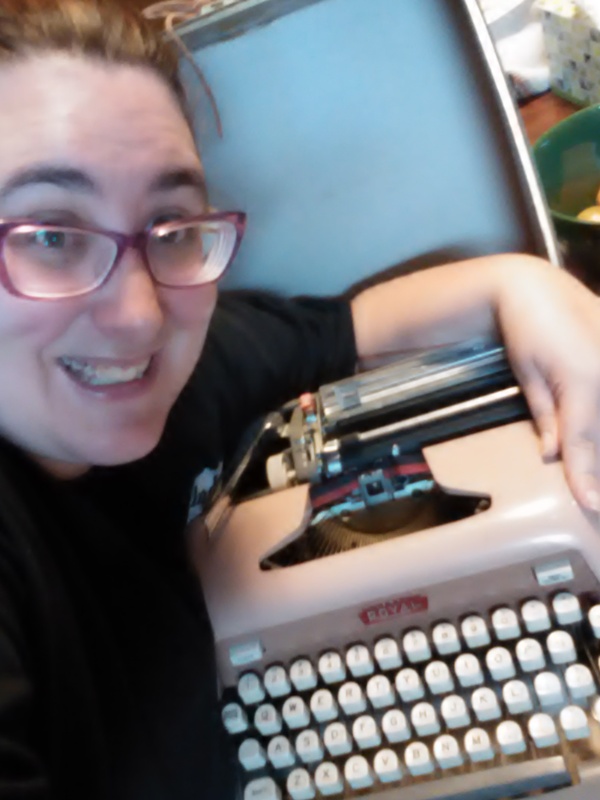 In the spirit of my ever present quest to find new inspiration, new writing tools, and new decorations for my areas of the home (and my family remodeling our old church building home), we went to an open house/estate sale today. (did I say NEW? Yeah RIGHT!) 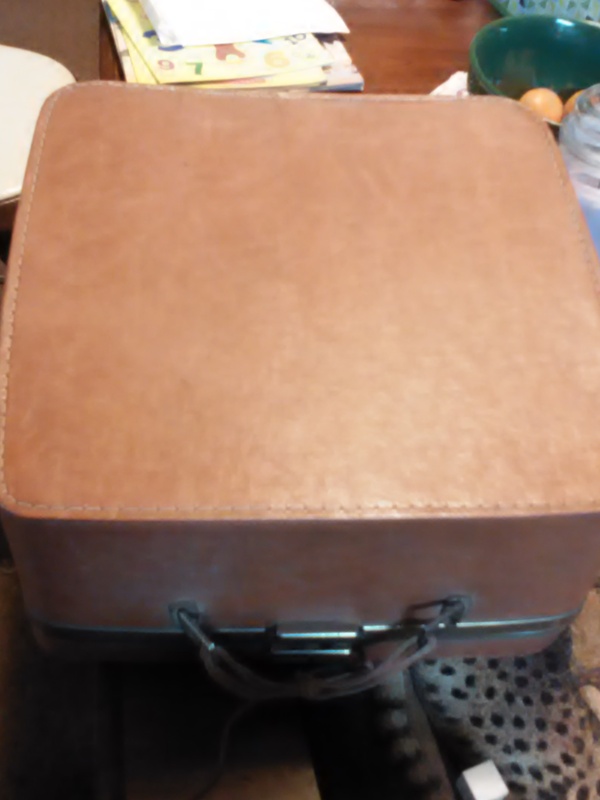 Among old dishes, old furniture, and VHS tapes was an unassuming brown box with a twine handle. The tag said $25 and I walked away with a heavy heart…My Great-Grandmother bought everything at a garage sale for a quarter or NO DEAL (to hear her tell it anyway) and I inherited some of those genes. I told my mother that I just couldn’t do the $25 but as they were garage sale surfing later, would she please keep an eye out for one at a cheaper cost. I’ve always wanted a little brown box like this. A few minutes later she and Dad came back out of the house and Dad unceremoniously plopped this bad boy into my lap with a “Merry Christmas” before closing my car door again. It seems the $25 came down to $10 when they bought a large couch and painting as well! To say I’m excited would be an understatement. I’m decorating with this sucker…I have an antique entry table with little spindly legs that will look GREAT holding this in the writer’s loft. ISN’T IT THE BEE’S KNEES?? 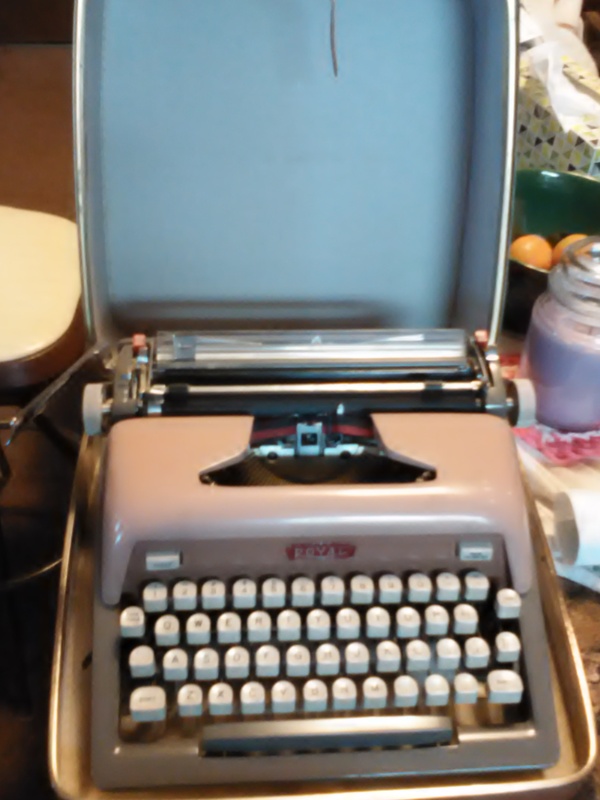 It comes with a retro type writer! I’m seriously considering checking into finding a roll or two of typewriter tape for this guy so I can do a few short stories on him for good luck and the experience of my words slapping themselves onto the paper one swift letter at a time! I geeked out hard and it doesn’t look like the nerdy grin is going away any time soon. You know what, I wouldn’t have it any other way! I’ve been a writer, bibliophile, and nerd my entire life. Why stop now when it’s finally getting good? I’m So SO SO SO SO SO Excited! Do you have any little quirks, retro decorations, or other pieces that you’ve always wanted or already have? TELL ME ABOUT THEM! Slap a picture in the comments if you want to…I LOVE hearing from you! May your days be filled to the brim with anything you might need in them. May inspiration knock on your door and refuse to leave. May the sun shine brightly upon your path and lead you to your typeset! So, here is my question: Should I just be concentrating on finding an agent for 1 previously unpublished work (most likely a picture book/leveled reader), or should I try to find someone who looks for children’s/fantasy/YA/Middle/etc. And when I do write that query letter, should I include the information that I self published through Createspace (though I would like to rework those projects and try to traditionally publish them…Middle Grade readers want to take AR tests after all) or should I just leave that part alone until a future date? I haven’t had much luck with traditional route before and have been self-publishing with my Dad for a few years now, but am wanting to find a way to get some of my work into schools and school libraries. Any advice or notes are appreciated! 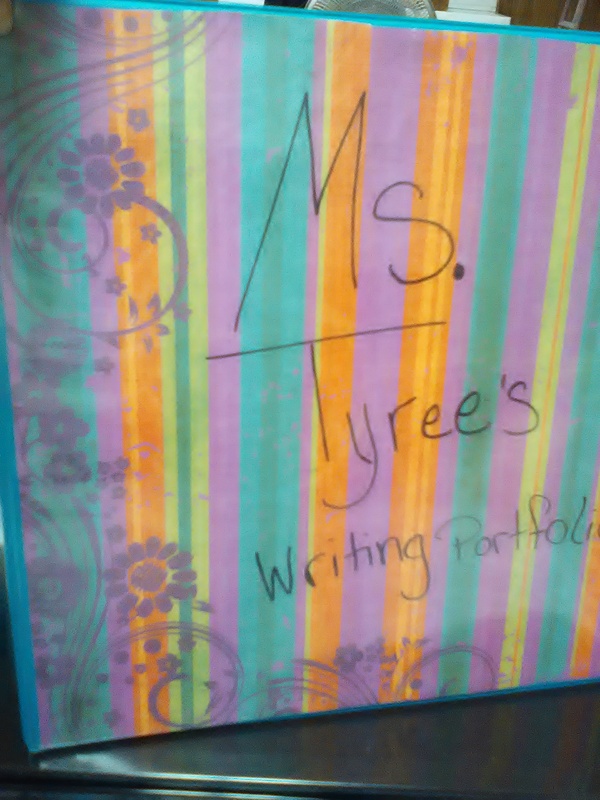 At the beginning of the school year I put together a writing portfolio with my students using a combination of old teacher manuals, a new book on teaching writing, and Pinterest ideas I had been pinning for years. What came about was, in my opinion, a fun and interesting container for student writing, notes, and ideas. 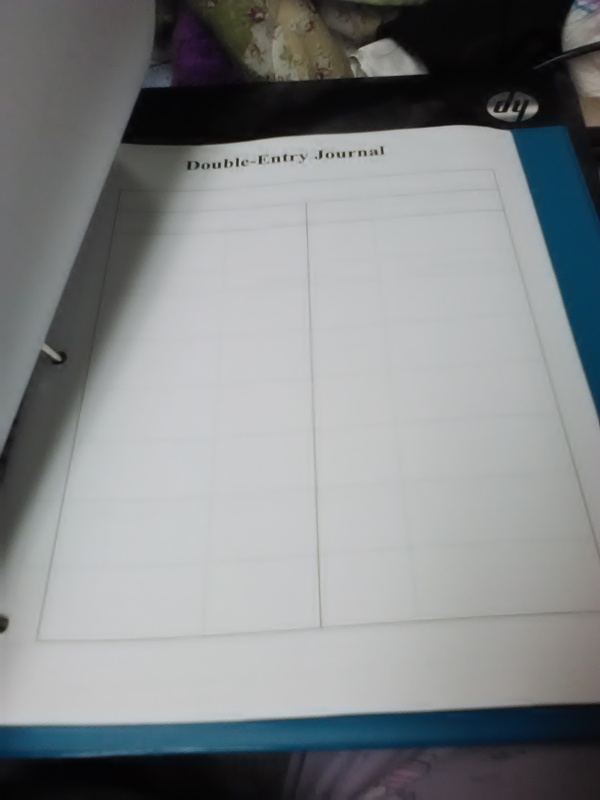 We used the portfolio 173 out of 180 days this year, the others were review and state testing days! Special Needs/IEP students used the exact same set up and papers as their classmates and working in these portfolios was like having an automatic active assessment as well as an immediate chance for remediation. I have been asked a few times, by a few different people, to lay out how I set this up. I don’t think this is a hugely different design from the rest of the portfolio ideas that are out there, but I took some pictures and will now walk you through the set up and use of my Writer’s/Writing Portfolio. And Pinterest ideas from various Bloggers for Anchor charts and craft ideas. As you can see, the first few pages of the portfolio offer more chances for personalization and connection with the students. The interior title page (“Ms. Tyree’s…) can be decorated etc, allowing for personality to show itself immediately. The dedication page makes future assignments go from horrid homework to being for someone students actually care about…whether they be friend, family, or famous. Dedicating their work in such a manner both transfers the responsibility from teacher to student (I dedicated to MY friends/family…I am the AUTHOR and must do MY best) and gives students a sense of ownership for their portfolio and their work. The Table of Contents page gives students a way to quickly flip through to needed information. 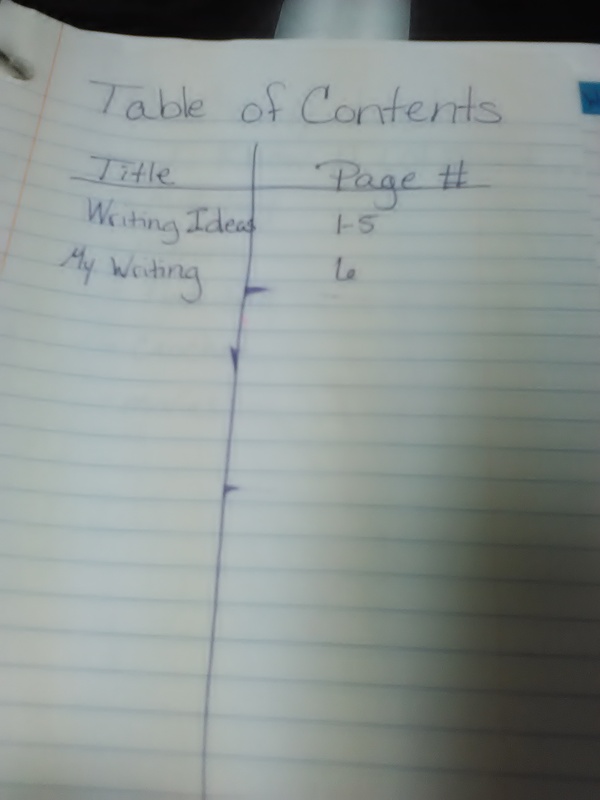 When coupled with the page dividers (shown in these pictures are actually strips of paper or sticky note written on and then attached via clear tape) the table of contents provides an extra organizational tool for all. 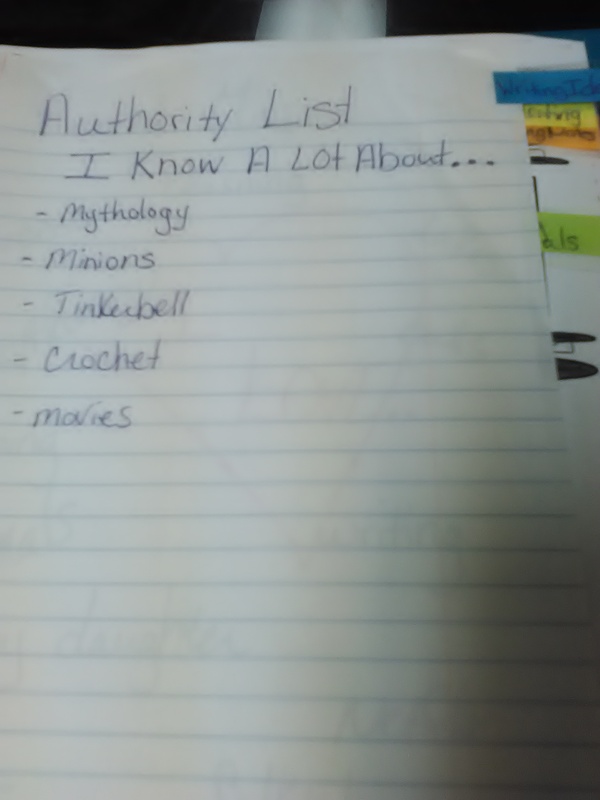 In the “WRITING IDEAS” tab we have the ‘AUTHORITY LIST’. The authority list is literally a list of items the portfolio builder feels authoritative about. 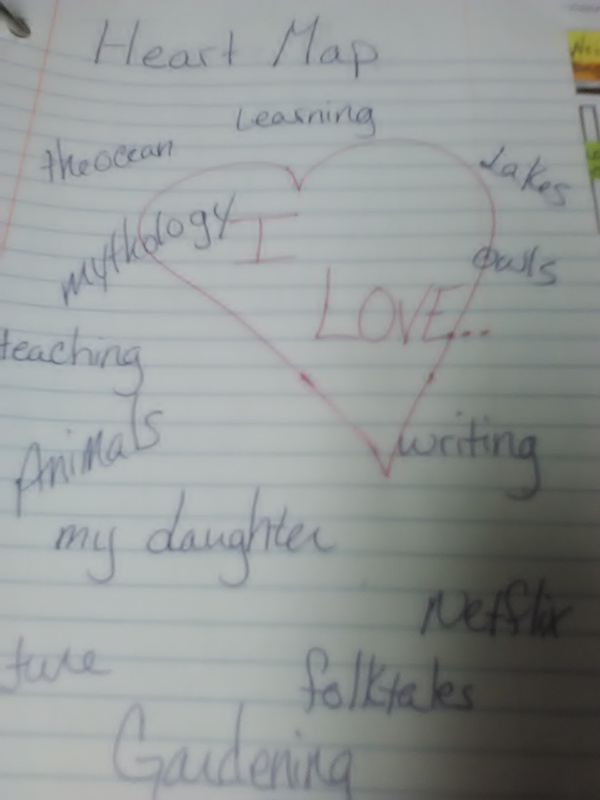 For example: my list (shown above) includes mythology and movies (writing research…really! ), and Tinkerbell, Minions, and Crochet. These are things I feel very knowledgeable about and if I need to decide on a topic for a quick in class essay, I can choose from this list and whip up a first draft fairly easily. That’s the point, after all, of the ‘ideas’ section: The ability to recall what you know about and write it down without too much of that frustrating contemplation that gets students down before they ever write a word. Next comes the Heart Map. Students (or other authors) draw a big heart in the center of the page with the words “I LOVE…” written inside. They then haphazardly fill the page with the names of things that they love. These are not necessarily items that they have to know a lot about, but merely things that they feel emotionally attached to. Many students will write things like ‘my friends, my family, soccer, music…’ and this not only gives you an insight into that particular student, it also provides them with topics for research projects, science experiments, or even art projects (to name a few). Third in line is the Treasure Map (not pictured). The Treasure Map is an interesting art piece in which students think of a place that holds a lot of memories for them. Hopefully this place will be a holder of both good and not-so-great memories, or mostly good (most people will not draw a map of a bad memories place holder). They then draw an outline/blue print of that place…much like a pirate’s treasure map would be laid out. Then they place an X over the places with the strongest memories (i.e. the tree house fort behind Grandma’s house, the creek next door, etc.). If they are asked to write a narrative and don’t know where to begin, a look back at the treasure map can provide a bevy of inspiration. WARNING: Younger students and some IEP students will have difficulty differentiating between writing a fictional account and writing the bare bones of whatever actually happened. With these students make sure that you either tell them to write the facts, or are VERY specific when it comes to the fiction you want. Don’t write it for them, but make sure they understand the difference. Finally, we have the memory hand, I also call the Emotions Hand. Students trace their hand and write a different emotion on each finger, the thumb, and their palm. They then (in a different color works best) list a few things that make them feel the emotion listed. (i.e. ANGRY often includes siblings, teachers, homework….PROUD was a difficult one for elementary students and usually just included good grades, winning a race, or praise from parents/teachers). 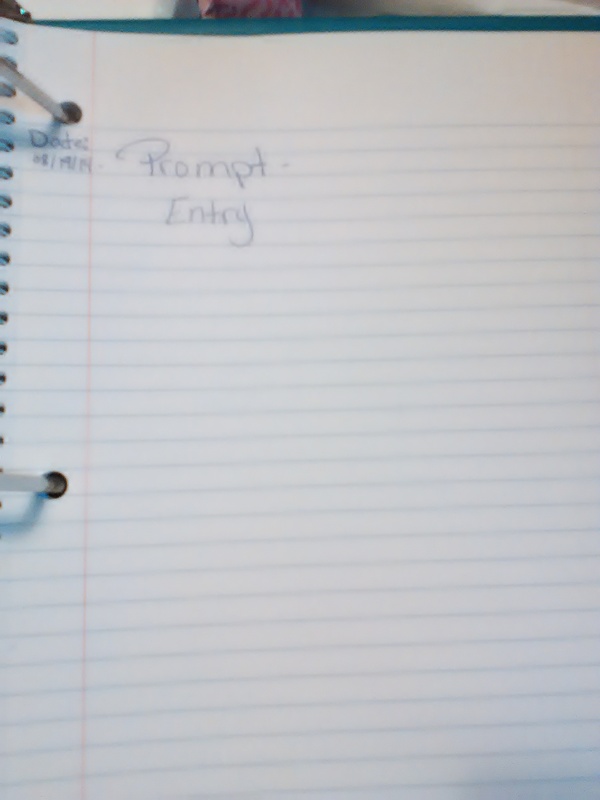 The beginning of our ‘Writing” section is a page for Goal setting. This is really included so that the teacher can have individual conferences with each student and set goals for their writing. 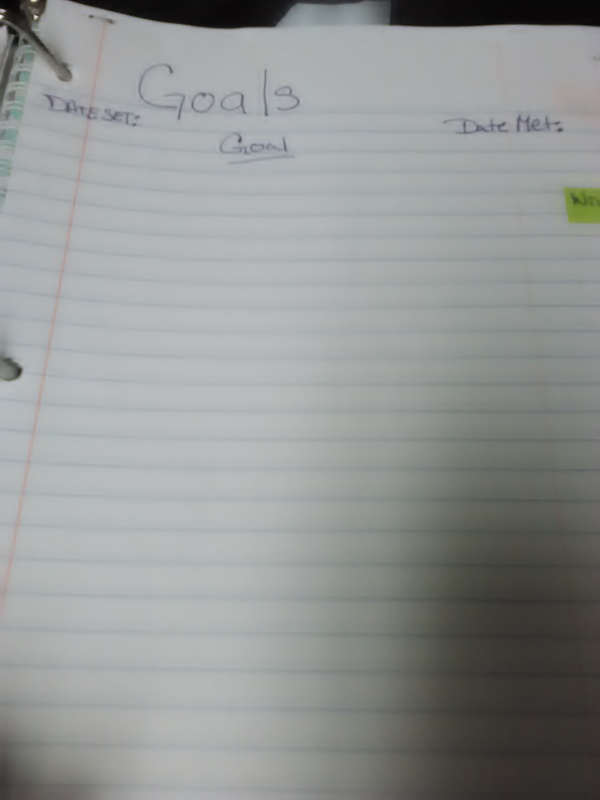 You put the date set, the goal, and then eventually the date met. Pretty simple right? Well I apparently can’t just leave well enough alone, so I not only did conferences, I also had students do small group/peer readings and discussions…and then they set another goal as well! This really pushed them to view their work not as another grade, or another essay for homework, but as something personal to them. Some of the best goals were set, and met, by my ‘special’ students, because (and I quote) “No one told us we could before”. 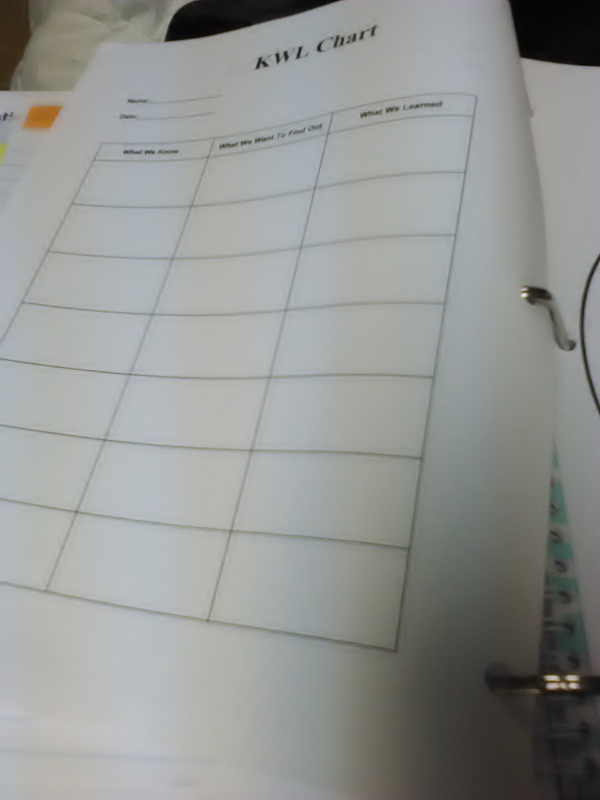 After the goals page is a set of loose leaf papers for story ideas and first drafts. The first page was a mini table of contents…students were asked to put the date written, the title, and the page number of their works. 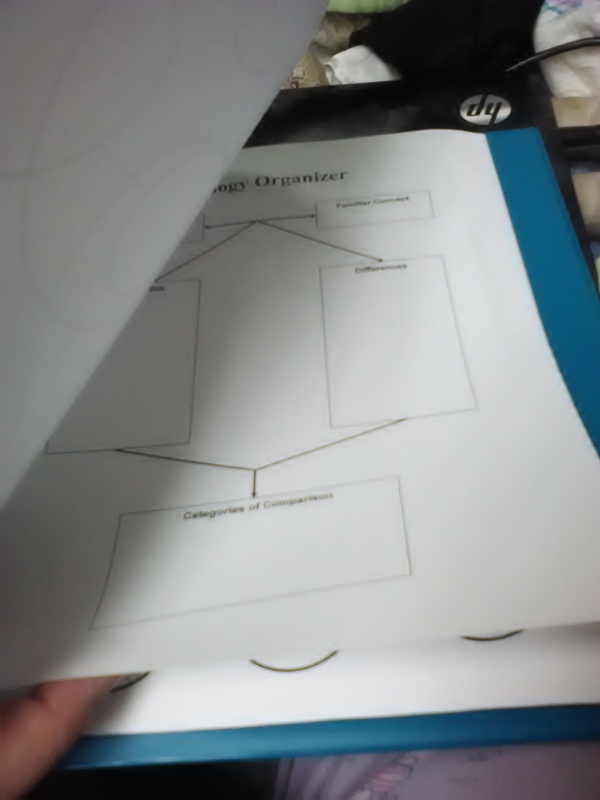 Then came the graphic organizers and outlines section. I passed out 13 pages of organizers and 3 types of outlines during the first week of school. 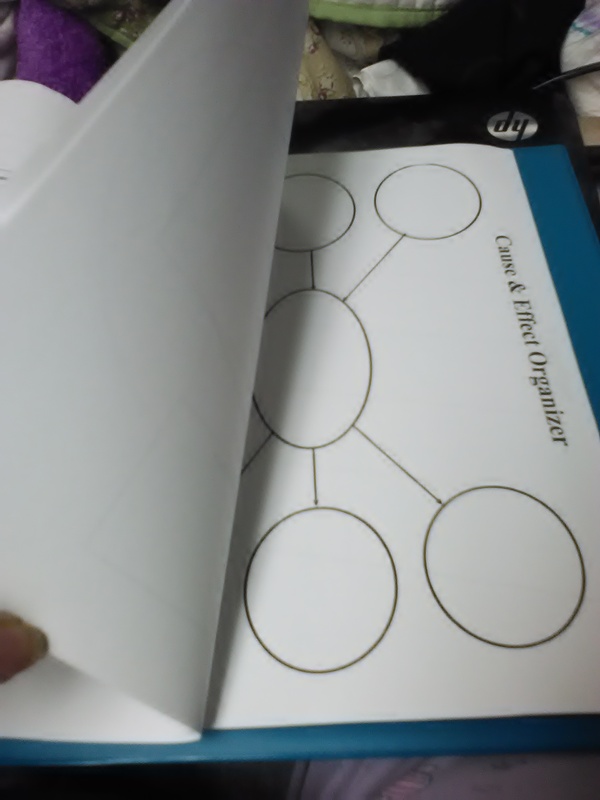 These included a KWL Chart, A Fact Chart, A Vinn Diagram, a Tree Chart, A Brainstormer, and a Cause and Effect Diagram. Since I taught fifth graders, we did some minor modifications to these pages, allowing them to use these much more easily. 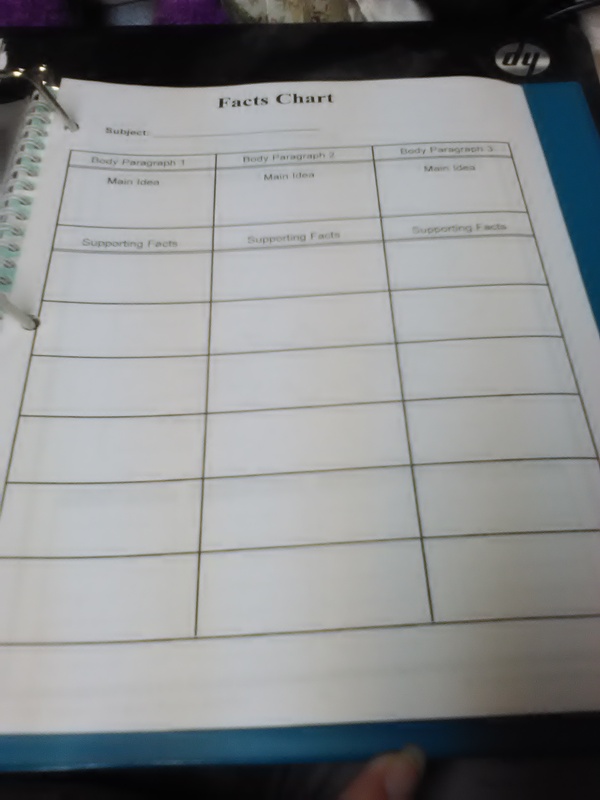 For example, the KWL chart had an extra column to allow for ‘things we couldn’t find the answer to’, while the Timeline page was alternately described as a paragraph outline…giving students a slightly different way to outline their essays along with the typical bulleted or roman numeral set up. 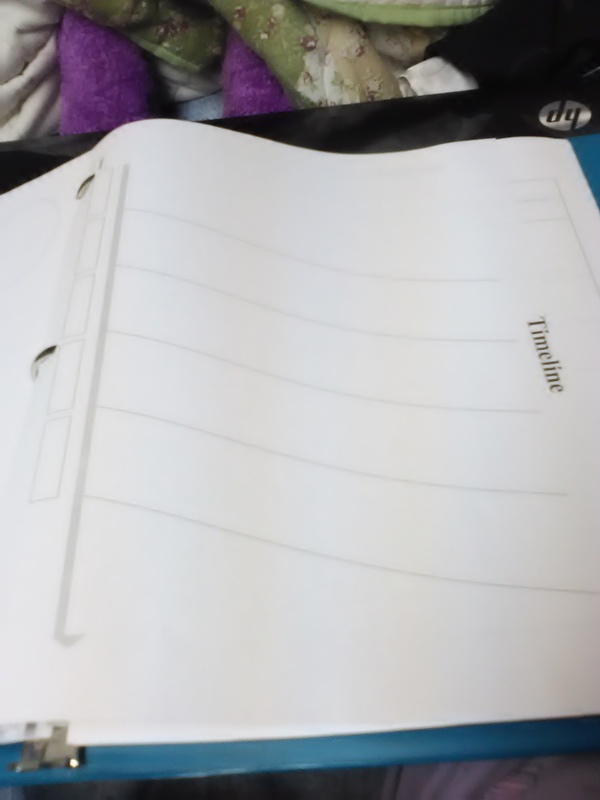 The final thing in our portfolios was, in my opinion, the most important; the writing journal. Every entry began with the day’s date in the upper left hand corner, then the word ‘prompt’ and the day’s prompt written out. Most day’s I gave the students 10 minutes to write to the prompt, usually while playing music softly in the background (a variety of artists and types). About 1 day a week I made students write without music, so that they would be used to noise or silence and able to work through during the testing (you never know what the ‘quiet’ class work next door might include!). Friday’s were always ‘free Friday’…allowing student creativity to come out as they wrote to their own inner muse for the day. The other day I took a tip from trending topics and asked my 5th graders to write their final journal entry over “What I Wish My Teacher Knew.” It was heart wrenching. Some of the students wanted to tell me about home things, sick family members that are being hush/hush, bullying in the neighborhood, worries about moving up to Middle School, or even missing parents. Some wanted me to know that although they’re good students, they HATE school. They don’t like studying, they hate having to answer questions, and they only want to hang out and play sports. In every class, they asked me what I wanted them to know. I responded, of course, that I am proud of them all and that they have been through a lot as a grade this year and everyone made it through admirably. Needless to say, we had an emotional day. 1) Ms. Tyree (and every teacher you’ve had) cares more about you and your future than you will ever know. We worry over you long after you’ve left our class and will remember you long after you forget who you had for 5th grade writing. 2) Sometimes, even though we really do care about you, we just need time to finish whatever it is we’re doing…even if all we’re doing is taking a deep breath! 3) There is never a good reason to insult people, even if you’re playing and it’s your friend…adults have a hard time with this as well. 4) I know you feel pushed around and talking back is a way to take some of that power you crave…get over it. There will ALWAYS be someone in charge of at least one aspect of your life. Bosses, spouses, parents, teachers, law makers, etc. will all have a say in what you do and how you do it. Fight for things that are worth it, but talking back just to hear your voice is not one of those things. 5) YOU (YES YOU!) are SMART. So maybe you don’t have the best grades and maybe sometimes you don’t understand everything the first or even fiftieth time….that’s ok. Everyone learns differently and everyone has things that are more difficult to learn. You CAN and WILL get it as long as you keep at it. 6) Stay Creative! The spark inside that makes you who you are, and that sends you twirling through the classroom on a whim, is an amazing gift. Never lose it. However, channel that creativity into art, mechanics, robotics, music, dance…anything that excites you and stop hopping like a frog in my classroom! 7) You are an Author….You Are a Scientist…and You ARE Amazing. I am very proud to have the honor of being in your lives. I have been stressing lately…ok, not just lately. For the past two months or so I’ve been stressed out about work, about the fact that I’m looking for work closer to home and might have to go back to working outside of education to accomplish that, and about how in the world I’m going to take care of my daughter while doing all of that and stressing too! It’s been horrid…and I have allergies cropping up that are really not helping matters any. I have worried, stressed, chewed over, etc every possibility I can think of, every second I can think! Today I realized something…I don’t care. I don’t need to stress or worry or any of those other things. I need to work and work it out. Whatever it is that I have to do, I’m going acetaminophento do it. 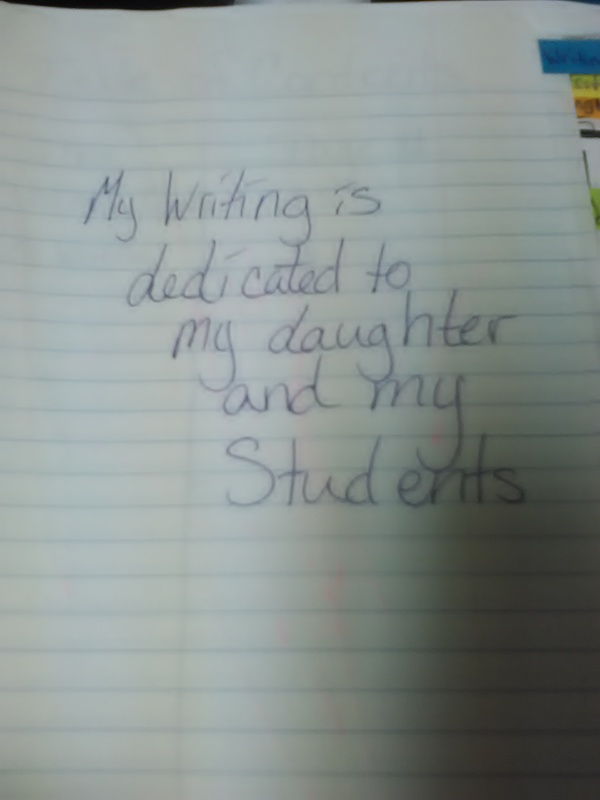 The two things I HAVE to do in my life are take care of my daughter and write. I just want to write. Whatever I HAVE to do in order to make it possible to handle those two things, well that’s just what I am going to do. I don’t know if I am talented at either thing, I don’t know if other people see me as a good mother or a good author…or even a good teacher if it comes down to that. But the truly amazing and liberating thing is that I don’t have to know. Knowing what they think is not a requirement for me to live or to be happy. I have to trust GOD, trust that my belief in HIM and my love of the things that matter to me will get me through whatever happens. I will survive, or I won’t. But my daughter will be taken care of and my words will propagate and the world will spin and none of that changes if I stress or if I don’t stress. The only thing that changes will, hopefully, be the amount of acetaminophen that I take in every day. And really, I think those companies can survive without me. Thank you for reading what I write and for encouraging me, even if it has only been through your ‘follow’. I hope that you are blessed and that your coming week is amazing. May your inspiration be limitless and your heart full.